“This morning about three at clocke hir Majestie departed this life mildly like a lambe, easily like a ripe apple from a tree. … About ten at clocke the Counsel … having bin a while in consultacion, proclaimed James the 6, King of Scots, the King … . The proclamacion was heard with greate expectacion and silent joy, noe great shouting. I thinke the sorrowe for hir Majesties departure was soe deep in many hearts they could not soe suddenly showe anie great joy… ”. 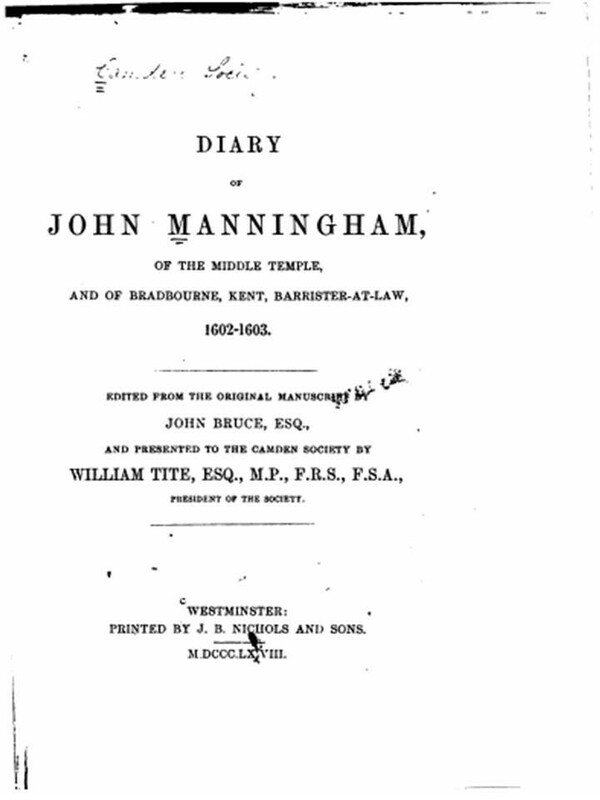 Manningham, who died in 1622, was in life a lawyer. The diary that he kept between 1602-1603, while he was studying at Middle Temple, provides an important primary source of information on various aspects of life in London in the uncertain transition from the Elizabethan era to the Jacobean (including the cultural and theatrical). This entry was posted in 17th Century London, Contemporary accounts of events, On this day, Tudor and tagged John Manningham on March 24, 2015 by Bob Jones - The Lost City of London. Nice to have that source. So many problems seemed to follow.